I think that I am just as excited (if not more!) as my preschoolers when I introduce a new sensory bin in our classroom! Even simple materials impress my 3 year-old preschoolers. It’s nice that now a few weeks into the school year, they are able to try their best at waiting patiently to get their turn in our sensory play area. 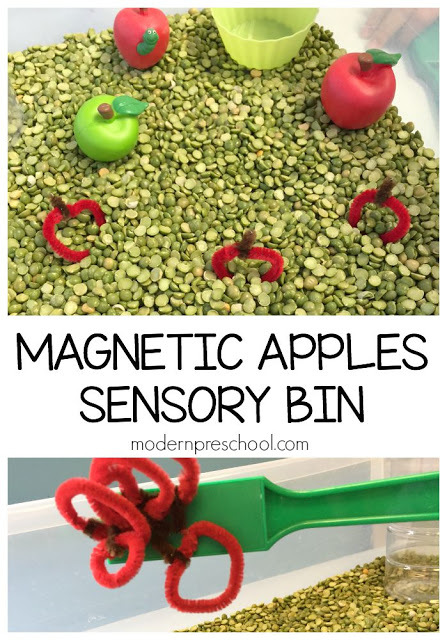 Our magnetic apples sensory bin was an instant hit with both of my classes! There was so much scooping, shaking, pouring, sharing, pinching, and magnetic play, they had no idea how much learning was happening too! 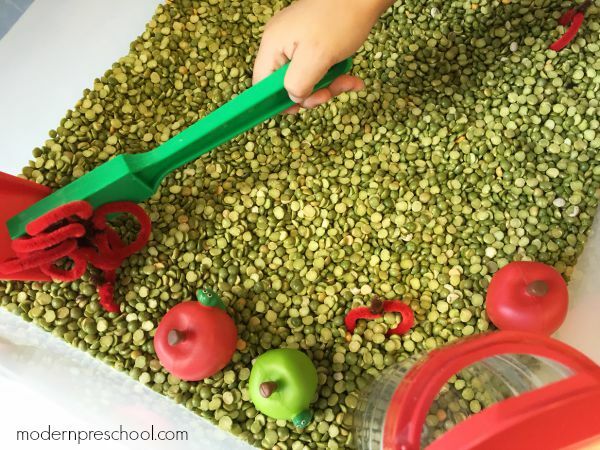 The magnetic apples were my favorite part of this sensory bin, but the simple act of shaking the split peas from the container by far won over my preschoolers! Making your own magnetic apples is super easy! 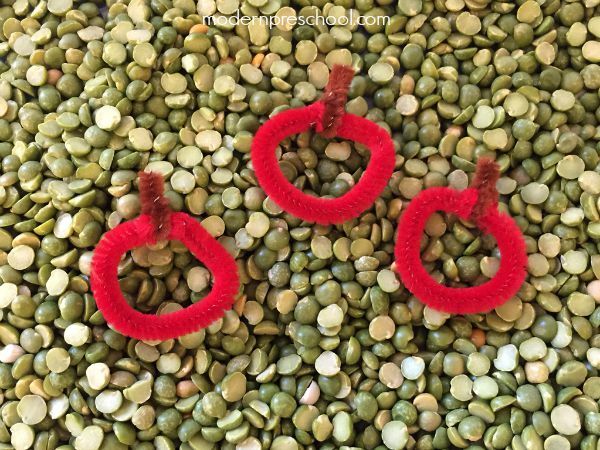 You just need PIPE CLEANERS! I used red pipe cleaners for the apples and brown pipe cleaners for the stems. I wrapped the ends of the red together by twisting them. I twisted the brown around the red and then around itself to secure it. Ta da! You now have magnetic apples. 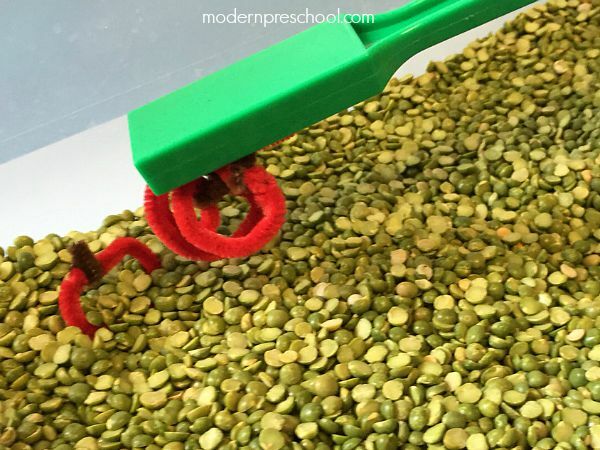 The sensory bin filler is dried split peas. They made me think of mini apples! I added a few of our red and green apples from our set of attribute apples along with a few small measuring spoons, scoopers, and empty parmesan shaker cheese containers. Our magnetic wands (found HERE – you need a set!) were used to search out the apples hiding under the split peas too! My preschoolers knew that there were 10 magnetic apples in the bin, so they were always counting and finding and hiding them while keeping track of them all. Lots of magnetic exploration and counting was happening with the apples! The split peas were a lot like rice. They were soothing to run your hands through, and were small enough to really shake up and pour. And scooping was easy even with the littlest sized spoons and scoopers. You can search through all of our sensory play ideas! Like this magnetic apple bin, they are simple to put together and super fun to play in. When it’s time to clean up a sensory bin, I’m not one to dump the filler. I use ziploc freezer gallon bags to store our split peas or rice or corn until next time! Apples are a great theme to use at the beginning of the school year. Printable learning centers (not worksheets) are perfect for small group activities and independent center time. 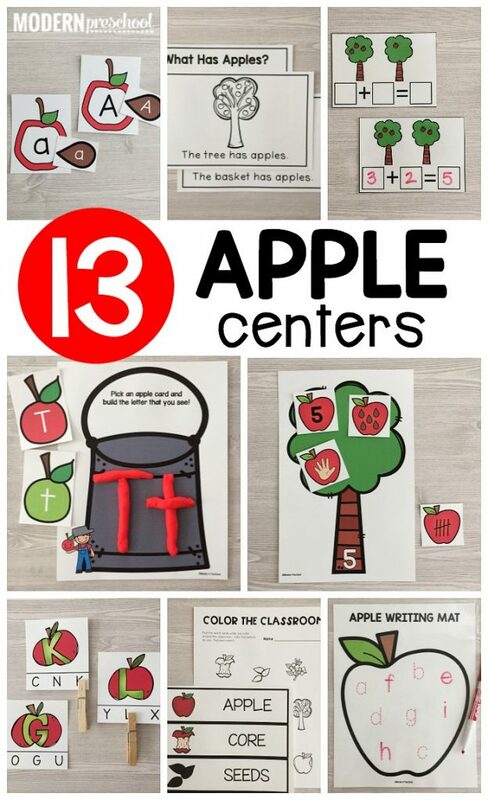 Check out these other apple activities for your apple theme!